Cloudy skies and a light south westerly breeze greeted the fleet for the penultimate day of the UK International Moth Nationals. After a brief postponement however the fleet launched and racing was soon underway. Arnaud Psarofaghis lead the way to the windward mark in race 6 followed swiftly by Simon Payne, Mike Lennon and Mikis Psarofaghis. In the shifty conditions however there was plenty of place trading between Payne and Arnaud to keep things interesting. However it was Payne who prevailed for his fourth win of the series, edging ever closer to a rare national championship win. Going into the final leg it was looking close between Lennon and Mikis Psarofaghis, however a broken boom put paid to race 6 for Mikis who was fortunately able to get afloat again in time for the following races. Also going well were lightwind maestros Jason Belben and Mike Cooke in his new boat who achieved 2nd and 4th overall respectively. Fireball supremo David Edwards had a mixed race in his Bladerider falling to 13th overall whilst Alex Adams made the most of his cake fuelled diet to achieve a respectable 7th. Also in the mix were Ninja rider Ben Patton and Hayling sailors Ricky Tagg and Tim Penfold. Following a significant wind shift and a course reset the fleet started race 7 in a building but still fluky breeze. Mike Lennon had a quick first beat to lead the fleet at the windward mark closely followed by Ritchie Lovering, Arnaud Psarofaghis, Ricky Tagg and Simon Payne. On the following downwind run Lennon took the left hand side of the run whilst the rest of the pack ventured right, this prevailed and he was able to hold the lead until the next upwind leg when Payne overtook. Simon held the lead for the rest of the race leading home Lennon followed by Arnaud, Tagg, Belben and Cooke and Ritchie Lovering. Ben Paton again had a good race as did Phare and Russell rounding out the top 10. In the final race of the day the wind again put the skills of the race team to the test by shifting more to the south and significantly building to 15+ knots. This lead to an ‘interesting’ sea state in the form of rolling waves combined with mixed chop from passing ferries and motor cruisers testing the ride height control systems to the limit. David Edwards decided to go for a ballsy start by running the line on port, this worked well until a rogue wave saw the Welshman pitchpoll in the middle of the line. The fleet then divided into a small pack consisting of Arnaud, Simon, Tagg and Phare that took the left side of the beat whilst the rest of the fleet took the right hand side. The left paid as Ritchie Lovering and Mikis Psarofaghis were the only boats to rejoin the pack at the windward mark with Ritchie taking the race lead. Arnaud Psarofaghis then put pressure on downwind to take Lovering just at leeward gate. Arnaud then took the left hand side of the course for the next beat managing to stay 50 meters ahead of Lovering and Payne to start the next downwind leg. Jason Russell also reentered the mix after some fast beats to battle with Mikis Psarofaghis, Belben, Tagg and Phare. On the final lap Alex Adams had a burst of speed to reenter the top 10 ready for the final downwind run duelling with Belben, Phare and Lovering. Belben had a wobbly moment in the final gybe of the race leading to a capsize but was able to get moving to pip Phare to the line in a photo finish to 7th with Adams and Lovering making up the rest of the top 10. 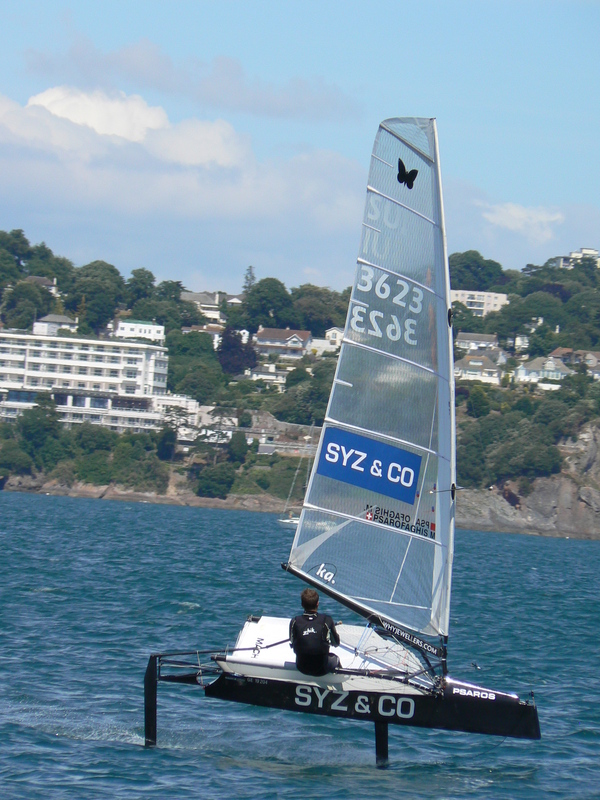 A glorious day in Torquay today – blue skies and a nice 12-15 knot breeze built late morning. Race 3 got away with a few a little too eager, including Si Payne who had to go back. He recovered well though, to follow Mikis P round the first leeward gate. By the end of race 3 Si had got the lead, followed by Mike Lennon and Mikis in 3rd. Race 4 saw the wind playing games a little with a few dead patches, but Mr Consistant Payne had no problems and came home 1st again, followed by Mike Lennon, Ricky Tagg and Jason Russell. Race 5 and the breeze was up, a 20 degree wind shift just before the start gun went made for quite an entertaining start – a bit of a pile up and quite a few pushed out. Although clear air seemed to help the most with those out to each side doing well. At the 2nd windward Arnaud had a good lead, followed by Si, Paul Hayden, Mike Lennon, Mike Cooke and Alex Adams. Next lap round and Arnaud had extended his lead, with Si still 2nd and Mike L 3rd. With the breeze up the race officer sent them round for a 4th lap, with Arnaud taking it, Si 2nd and Mike Lennon 3rd, behind them there was a bit of position changing going on, by the finish Richard Lovering claimed 4th, Paul Hayden 5th, Jason Russell 6th, Alex Adams 7th and Ricky Tagg 8th – he’ll be kicking himself for dropping the mainsheet in the gybe on the last run letting Alex and Jason past. Back on shore and everyone is looking a little tired, a few selected quotes: “Where’s the masseur’s? !”, “I think it’s past my bed time!”. Those that aren’t still bimbling have made it to the bar for happy hour for a well deserved drink. 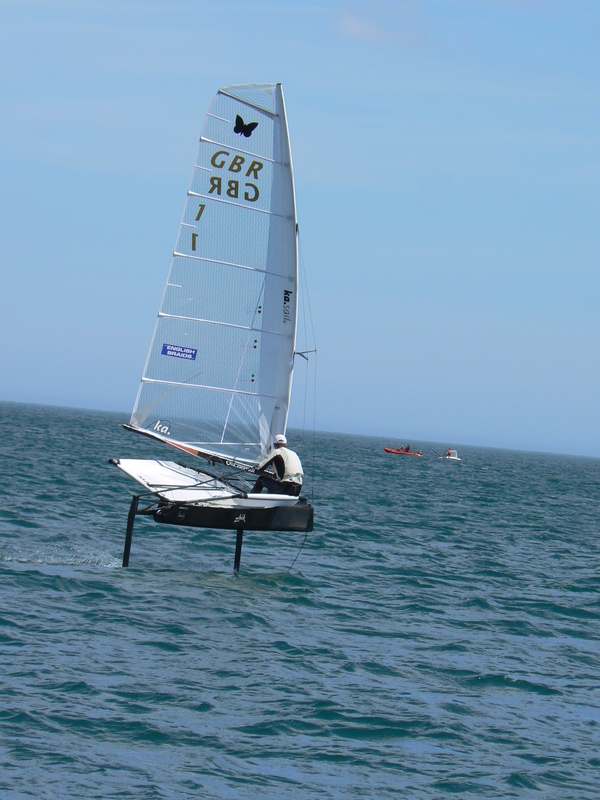 Menacing waves combined with a light and fluky easterly breeze made for challenging conditions on the first day of the UK International Moth Nationals. Race one started in a 12 knot breeze with Arnaud Psarofaghis leading the fleet around the windward mark with a notable margin. Simon Payne however kept the pressure on for the downwind leg to close the gap and take the lead on the following upwind leg. Mike Lennon was also on the pace leading a pack consisting of Tagg, Edwards and Lovering. Payne then held the lead for the rest of the race for the win. Arnaud over took Lennon on the final run for second and third followed by Belben. 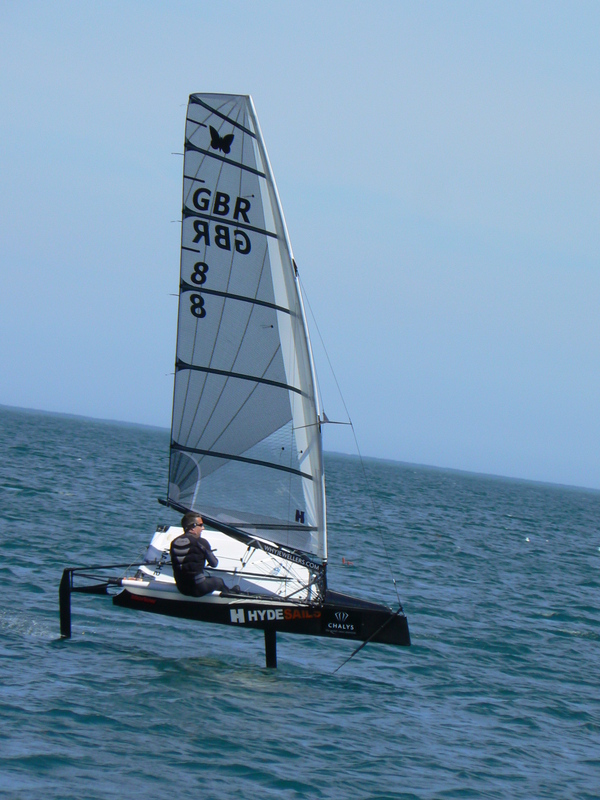 A notable casualty of the first race was Mike Cooke who following a fast couple of laps using his new foils retired with a broken mast. Race two started in similar conditions to the first race with most of the fleet heading out to the left hand side of the course in search of extra breeze. Mike Lennon lead Simon Payne, Jason Russell, Jason Belben and Ricky Tagg around the windward mark. Lennon’s lead however was shortlived as European Champion Arnaud Psarofaghis had a blistering downwind run to take the lead. This lasted until almost the end of the next beat when Jason Belben and Ricky Tagg overtook. The wind then decided to cease playing ball and began to die and dramatically shift. This played into the hands of lightwind specialists such as Belben who extended his lead to take the win from Arnaud, Payne, Lennon and Tagg.